We are seeking two Marketing and Events Interns in our city centre office to support our events team in all aspects of concept development, production and account management. The applicant Interns will be an enthusiastic under-graduate looking to gain more experience in events and agency life. Neon Agency is a Dublin-based creative events agency. We partner with agencies, brands and companies to create, manage and deliver high-impact, memorable events, brand activations and live experiences. Assisting Senior Event Managers and production team on events – from proposal stage to management onsite. Account administration including staffing and logistics. Social Media Management including creating content and managing social media feeds. Have a strong interest in the events industry. Have strong proficiency in Microsoft Office – specifically PowerPoint and Excel. Be proactive in getting work done in a fast-paced environment. Be willing and able to work evenings and weekends when required. Be creative, motivated and have the ability to work from own initiative. Design skills are not required but a strong bonus. Applicants must have their full driving license and own laptop. We are made up of world class event professionals with a wealth of experience, who are engaged, enthusiastic and creative. You will have the opportunity to gain invaluable experience in the events industry and eventually manage your own small projects. Work for an award-winning agency, who has recently won “Best Experiential Agency 2018” at the EIA’s and “Best Marketing Event 2018” at the “International Live Events associations Gala Awards”. If you are interested in working at Neon Agency, please send your CV and cover letter in the body of an email to hello@neonagency.ie with the subject line “Events Intern”. When applying please specify which internship role you are applying for. 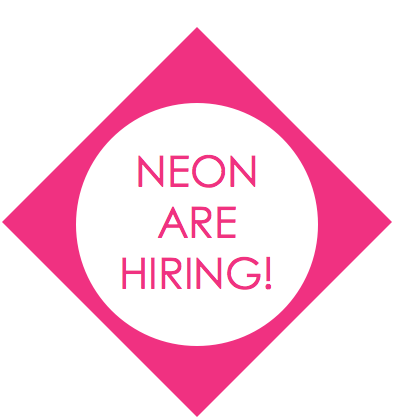 We would love to hear from you and learn what you can bring to the Neon team!